It’s official, the Christmas period is over. How sad. But if like me you have various Christmassy left overs and still want the joy of eating delicious spiced cakes, I have the perfect recipe for you, courtesy of Lucas Hollweg from Sunday Times Style. This recipe was published before Christmas and I tried it as an alternative to mince pies. 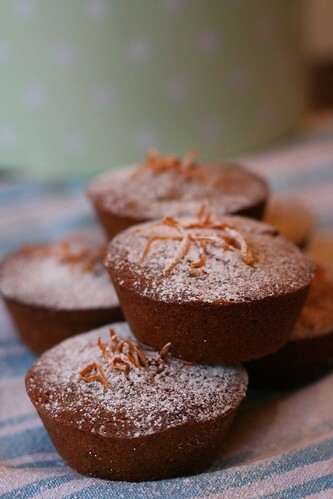 I am never disappointed with cakes that are baked using ground almonds and mixed with delicious mincemeat and Christmassy spices, this recipe is a winner. The original recipe included an orange cream and mincemeat topping but I swapped this for a dusting of icing sugar and grated orange peel and incorporated more mincemeat into the cake batter. I also adjusted the baking time – mine were in the oven for 25 minutes. 1. Melt the butter in a pan over a low heat until it bubbles and froths, then put to one side. Put the icing sugar, almonds, flour, lemon zest and cinnamon in a bowl and mix together well. Stir in the egg whites, then beat vigorously for about 10 seconds. Pour on the melted butter and beat until everything is thoroughly combined. 2. Fold in 12 tbsp of the mincemeat, then divide the mixture evenly between the muffin holes. Put the tin in the oven and bake for 20-25 minutes. Check whether the cakes are cooked by inserting a skewer into the middle of the cake. If it comes out clean, they are done. If there is batter stuck to the skewer, stick them back in the oven for a while longer. 3. Leave to cool slightly before transferring to a cooling rack. Once cooled completely, dust with icing sugar and lightly place orange zest on top. Enjoy! I just came across your blog today, and I wished I had read your blog earlier. This recipe is wonderful. Thanks for sharing this.